10.5 kilometers. 90 poles. 30 workers. 1 goal: power to Karawa. 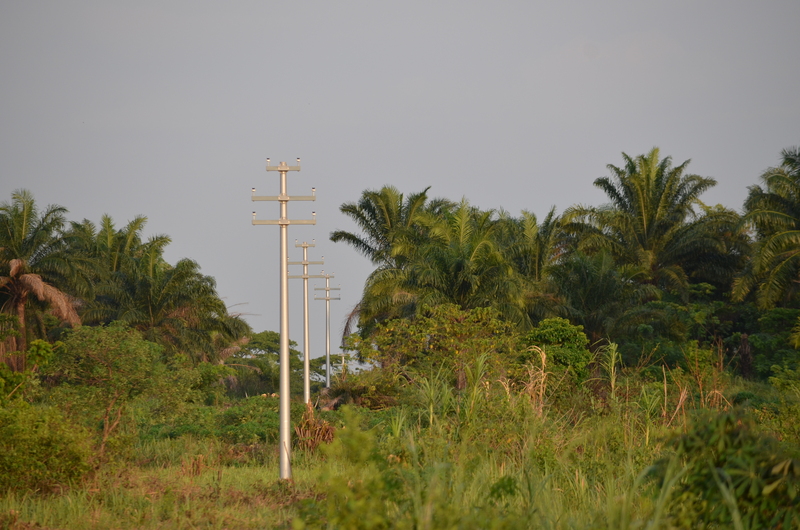 Over the last month and a half, a massive combined effort has led to the installation of new poles for the Zulu power line along a route over ten kilometers long from the Zulu Dam to Karawa hospital. 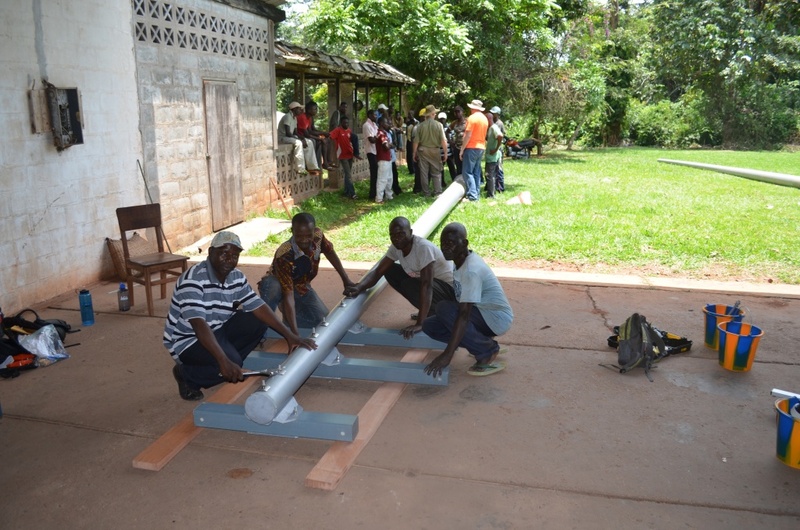 In March, three American engineers (Jon Coker, Drew Coker, and Jerry Penick) spent two weeks working with a group of Congolese (Etumba, Silva, Djof, and Bolongo) engineers, technicians, laborers, and missionaries to plan, test, and launch this effort. 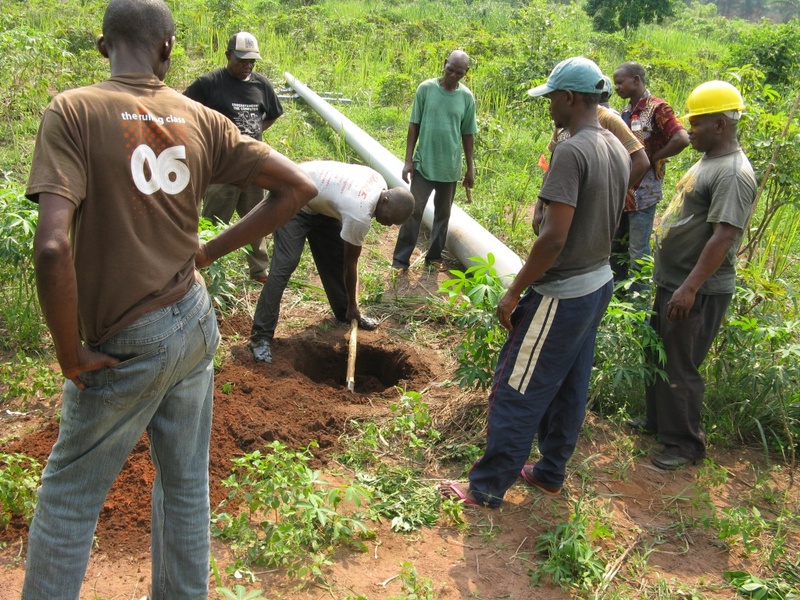 These engineers work under the oversight of the Covenant Church of Congo (CEUM), our partner. Today, this phase of work is nearing successful completion! Upon arrival in Karawa, the group split into two teams. One team was charged with clearing brush and trees along the line’s future location. Before the labor could start, this task involved GPS equipped survey equipment that was used to mark the location of each pole while the cutting team plowed forward (the pole locations had been previously marked using Google Earth Pro and data from prior trips). 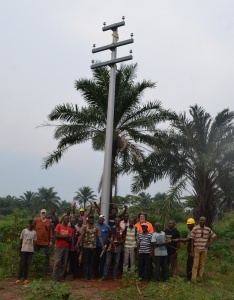 The second team was in charge of mounting poles. In the States, many of us have seen cranes and backhoes used to put up power lines. The Karawa team did it all by hand. After digging a hole to a predetermined depth, the 10-11 meter poles were assembled, positioned, and hoisted from below by about ten people while guides used ropes to steady the pole as it went up. It was a joy to hear the team singing as they did this work! Once a process was developed, the team became very efficient and completed over eighty installations in under a month. The bulk of the labor required to install Zulu’s new power line has now been completed, and we’re looking forward to the next steps. Over the next few weeks, technicians in Karawa will be installing the final six poles. In a few months, a team of engineers will be back in Karawa to hang and connect the power lines. These poles require special attention since they have to be placed in a marsh. The scale of this project is astonishing. It would be remarkable in any context, but when we consider the difficult terrain and lack of machinery, it’s hard not to be a bit dumbfounded and amazed. More than the accomplishments, however, we delight in the partnership. Paul Carlson Partnership is deeply grateful to the donors who support this project, to Jerry, Drew, and Jon who give so much of their time to it, and to our partners in Congo who are ultimately leading this effort. Please continue to pray with us for this project’s timely completion and for the ongoing work of the CEUM. To support more projects like this, give to our economic development programs today. Posted in Congo economy, Congo health, PCP Update.